We are pretty fitness-obsessed (as if you couldn’t already tell). However, this love extends far beyond just the gym and our workouts. There are some tried-and-true things that keep us on track, or provide us great incentive to keep going. Leggings that stretch and places for quick meals, ways to keep track and tunes to take on those hills, below are a few of our favorite things! 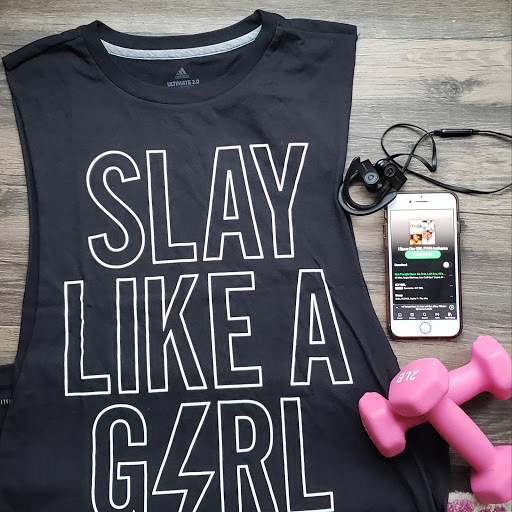 The list below is also a great starting gift guide for your friend that is fitness-obsessed, or that new tool that will help you keep it right and tight this holiday season. When you look good, you feel good. That same mentality goes for what you wear to the gym. On those days when it’s a little hard to get out the door, or motivation is waning, the right outfit can significantly boost your mood. Also, life is crazy busy. Sometimes, those errands you need to run just has to get done after the gym. Don’t risk running into your neighbor/ex/cousin in anything less than your gym best. ‘This has easily been the year of Fabletics as we’ve purchased outfits, gym bags, and even shoes from the company. We also wore pieces from Fabletics throughout our photo shoot for the blog launch this summer, so this brand has a special place in our heart. Fabletics is a subscription-based service that rolls out new outfits every month and your monthly fee typically covers the full price of at least one new set. This includes tights with a bra, tank/tee, or jacket. Want to try on an outfit before buying? Fabletics also has brick-and-mortar stores across the country! Our favorites include the High-Waist Printed Powerhold 7/8 and Salar Printed PowerLite Capri. Another perk, the range of sizes! CaCera loves being able to buy tights in their “tall” length. They also have “short” for petite girls and sizes range from XS - 3X. Athleta’s apparel crosses every part of the modern woman’s life. Their stores are split into sections and covers everything from the woman who likes to be cute and comfortable while traveling or brings a more sporty style to her office attire, the studio-obsessed chic, and the girl who loves the outdoors and a good adventure. Our favorite tights this season has to be the Essex Hybrid Tight in camo. Although these tights are super thick, the moment you put them on and finish your toughest, sweatiest workout session, you’ll be in love. They keep everything right and tight, they are so comfortable you will want to live in them, and you will be dry with no sweat marks in sight. A feel-good bonus: Athleta is a Certified B Corporation. This means they are legally required to consider the impact of their decisions - from the sustainable fibers and water-saving techniques used, to the way they empower and promote women. Looking to slay on a dime? Look no further than Target. Target has come a long way in the athleisure space. Their JoyLab line will get you from yoga to lunch with girlfriends in one cute outfit! By combining street style elements and the latest activewear technology, this workout line is the definition of Fit with Finesse! They have everything ranging from leggings, jackets to sports bras and swim wear. CaCera feels like her whole life was changed when she splurged on a pair of Powerbeats3 Beats by Dr. Dre headphones. Constantly fighting with a long cord connected to her phone is just fussy and inconvenient. The long battery life of these headphones and the comfort of the flexible earhooks make them a must for the serious gym rat. You can also take calls, control your music and activate Siri with RemoteTalk making these a good life hack. Shawnie keeps it simple and cute with her favorite pair of wireless headphones, Picun BT08 bluetooth headphones in Rose Gold. During a serious workout session, these beauties drown out all the outside sounds and will have you in a serious zone. Although they have an earmuff design, they fit snug so you don’t have to worry about them falling during that last burpee burn. You can also take calls, if you must. If there is any one item we recommend, it’s the power of a good fitness planner. Regardless to if you like to have everything at your fingertips through your phone, or rely on writing everything down (like us), we preach these as a necessity. Fitness planners can easily help you stay on track by providing you a tangible place to see your workouts, meal plan and water intake. There have been times where we’ve looked at pictures and wanted to get back to where we were 3, 6, 12 months ago. We can easily flip back through our planner, or pull out one from a previous year and see exactly what our regimen was and how we can tweak where we are now. There are quite a few on the market, so here are our go-tos. Band.do 13-Month Planner – The option for when you want to keep your whole life in one place. CaCera uses this one and loves the big blocks of space that allow her to write down her workouts each day, as well as all other meetings, events, etc. The planner comes with note space at the beginning of each month, quotes and phrases that are empowering throughout the book and stickers to make it extra cute and customizable. There’s also folder space to keep a few keepsakes close by. Lorna Jane Active Living Diary – Whew child! This diary! It’s similar to Band.do in that it offers a ton of space to do all your writing and tracking. The major difference is that it everything about this one revolves around health, wellness and fitness. This is Shawnie’s go-to. There’s room to write down your yearly goals, and each month provides pages to write down more targeted monthly and weekly goals. The artwork throughout is great motivation and the diary includes healthy living tips, recipes and workouts to try. 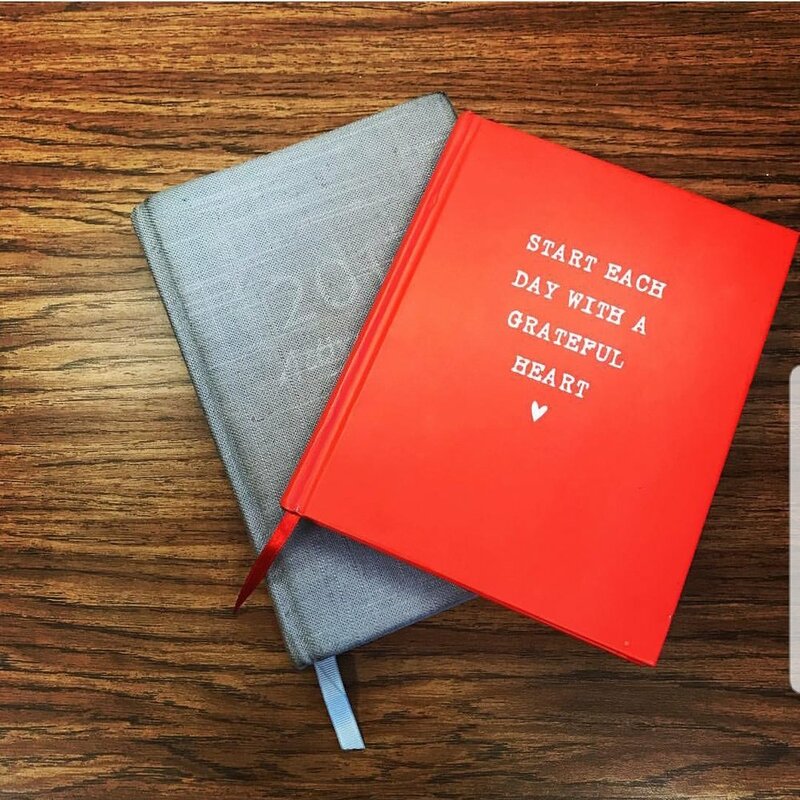 Fitlosopy Fitspiration Gratitude + Fitness Journal – Health and wellness is top-of-mind with this three-month journal. It’s another all-in-one option that would be great if you want to think of your goals in quarterly segments. A great addition to this journal is a space included for you to journal what inspires you, your mood, and what you are grateful for each day. It’s also available in Target. This has been our go-to gift for friends who are just starting their fitness journey. Yes, meal prep is life. But sometimes, life takes charge and doesn’t allow for the meal prep time. Below are some of our favorite quick eats. Each offers gift cards if you are looking for some healthy options to help loved ones stay fueled and full this season. Sweetgreen – So, we are talking obsessions here, right? Before moving from Los Angeles, Sweetgreen became an obsession for CaCera. She was easily popping into one at least three times a week. She may have even risked missing a flight when she came to town for a visit so she could grab a bowl to take on the plane with her. Sweetgreen is a fast-casual chain that is focuses on simple, seasonal, healthy food. The food is fresh, sustainably-sourced and flavorful. Their combinations are far different from what you would find as most traditional fast-casual chains. You can truly trust that you are putting the best food into your body and it’s great when you are in a pinch. Want to give them a try? Go for the Fish Taco Warm Bowl, or the Winter Maple Squash Bowl with favorites like roasted squash, apples and raisins. If you are making your own bowl, always add the roasted sweet potatoes and spicy chickpeas. EveryTable — EveryTable holds a special place in our hearts. To ensure that everyone can afford their meals, they price them according to the neighborhoods we serve. Intentionally placed in food deserts, underserved communities with little or no access to healthy food, as well as more affluent areas throughout LA, EveryTable sells fresh, nutritious, made-from scratch food, at low prices. And y’all, it taste amazing! Try the Salmon Superfood Salad (Roasted Salmon, Roasted Sweet Potato, Pickled Red Cabbage, Tamari Pepitas, Quinoa & Beluga Lentil Mix, Turmeric Ginger Vinaigrette) or their Jamaican Jerk Chicken (Smoked Chicken, Rice, Beans, Kale, Carrot, Plantain, Spicy Jerk BBQ Sauce). Your mouth is watering right now right?! CaCera & Shawnie December 3, 2018 Christmas, Christmas gift guide, gift guide, Christmas fitness gift guide, fitness gift guide, fitness obsessed, Fableticx, Athleta, B Corporation, B Corp, JoyLab, C9 by Champion, fitness apparel, athleisure, best fitness tights, beats by dr. dre, powerbeats3, wireless headphones, best headphones for they gym, gym gift guide, gym fashion, fitness planner, band.do, ban.do planner, fitlosophy, fitbook, lorna jane, lorna jane active, lorna jane 2019 diary, fitness journal, fitness diary, sweetgreen, everytable, wild beets, los angeles, los angeles eats, memphis, memphis eats, los angeles healthy spots, healthy food, best healthy restaurants in Memphis, best healthy restaurants in Los Angeles, good eats, health, wellness, PicUn, wild beet salad co.